1Institute of Wood Chemical Technology, Faculty of Wood Technology, Poznań University of Life Sciences, Wojska Polskiego, Poznań, Poland. 2Department of Water and Soil Analysis, Faculty of Chemistry, Adam Mickiewicz University in Poznań, Umultowska, Poznań, Poland. Increasing emission of greenhouse gases, mainly carbon dioxide, and reduced capacity of carbon sequestration due to excessive deforestation are the dominant reasons for the observed climate warming. Wood and wood products are inherent parts of the overall carbon “jigsaw puzzle”. Wood products require much lower process energy and result in lower carbon emission than non-wood products. Therefore, the prolonging lifespan of wood products seems to be a good economical and environmentally friendly solution. The aim of the research was to determine the effectiveness of wood treatment with aminosilane, caffeine and the mixture thereof to enhance its durability. Thereby, their potential impact on the environment was intended to be checked by allowing for carbon storage in treated wood for a longer period of time. Pine wood samples were vacuum-treated with three formulations: aminosilane, alkaloid and the mixture thereof. The resistance of wood against brown-rot fungus was assessed. Carbon content and carbon emission from wood samples were determined. The best results in wood protection against biodegradation and the highest carbon sequestration effectiveness were achieved for the two-component mixture. Interactions between these chemicals and wood prevented their leachability. This resulted in increased durability of the treated wood samples, sequestering carbon for a longer period of time and limiting its emission from wood to the atmosphere while exposed outside. Keywords: Aminosilanes; carbon capture; carbon sequestration; organosilicon compounds; wood durability; wood treatment. Global warming has been an unquestioned phenomenon over the last 50 years. As suggested by The United Nations Intergovernmental Panel on Climate Change in the 2013 report, it was caused mainly by anthropogenic factors which had led to an imbalance in the global atmospheric carbon pool (IPCC 2013). For most of human history, carbon has been in a more or less steady natural cycle between vegetation, the soil, the ocean and the atmosphere, additionally influenced by weathering of rocks and volcanic emissions (Cox et al. 2000). Currently, the original carbon cycle has been disturbed and the shift of carbon is observed from storage in fossil fuels and vegetation into the atmosphere. A continued increase in consumption of fossil fuels, which are long-term reservoirs of carbon, raises serious environmental concerns. Serving as primary energy sources, they are used for overall electricity production, transportation and industry, which rapidly depletes their deposits. Thereby, an enormous flux of carbon is released (Buchanan and Levine 1999). What is more, the rising global rate of deforestation and forest harvesting massively exceeds the total forest regrowth resulting in a net carbon flux from the forest sector to the atmosphere (Siudek et al. 2015). Depending on climate as well as the concentration of atmospheric carbon dioxide, only about half of the carbon dioxide emission is absorbed by the ocean and land ecosystems. Presented by Cox et al. (2000), the results from a fully coupled, three-dimensional carbon-climate model indicate that “…carbon-cycle feedbacks could significantly accelerate climate change over the twenty-first century…” and that by 2100 the global warming could raise up by 5,5°C. Both carbon dioxide emission and carbon storage are inextricably linked to the world’s forest ecosystems as well as the forest and wood industry. On the one hand, some fossil fuels are consumed by forest industry for logging, transportation and processing operations, being the source of carbon dioxide emission. On the other hand, indisputable is the role of forests in mitigation of greenhouse gas emissions and the necessity of sustainable management of these natural resources, considering all the issues competing for limited quantities of land and biomass (Millar et al. 2007, Canadell and Raupach 2008, Canadell and Schulze 2014, Nunery and Keeton 2010, Puhlick et al. 2016, Roxburgh et al. 2006, Spittlehouse and Stewart 2004). Wood and wood products are inherent parts of the overall carbon “jigsaw puzzle”, taking into account the use of wood as a fuel, use of fossil fuels for wood processing as well as the storage of carbon in wood products. It has been shown that using wood as a fuel can significantly contribute to the reduction of greenhouse gas emissions (Gustavsson et al. 1995, Hroncová et al. 2013, McKechnie et al. 2010, Petersen and Solberg 2005, Scharai-Rad and Welling 2002). However, the increased demand for biofuel may even cause escalated depletion of forest resources (Skog 1993). Hence a sustainable management of this raw material is obligatory, considering the promotion of agroforestry or use of degraded land for launching forestry plantations of rapid growth species for fuel wood (Albrecht and Kandji 2003, Hroncová et al. 2013). Wood products require much lower process energy and result in lower carbon emission than non-wood products utilising more fossil fuels in their manufacture. Therefore, the more prevalent use of them seems to be a much more economical and environmentally friendly solution. As confirmed by many researchers, a shift towards greater use of wood in buildings instead of brick, aluminium, steel and concrete results in a decrease in the fossil fuel requirement as an energy source thus limiting carbon emissions (e.g. Buchanan and Levine 1999, Gustavsson and Sathre 2006, Perez-Garcia et al. 2007). The unique mechanical and physical properties of wood and its aesthetic appeal make the material attractive for various applications in many sectors of the society. As a natural polymer and a renewable raw material with high elasticity and strength per unit weight comparable with the strongest steel, low weight and great thermal and insulation qualities, wood seems to be an ideal material for the construction industry (Ramage et al. 2017, Rowell 2012, Wilcox et al. 1991). Unfortunately, wood is often perceived as a non-durable material through its susceptibility to the destructive action of abiotic and biotic factors. Lack of durability is often considered as one of the primary drawbacks of wood for certain applications and is the crucial problem from the economic point of view. Induced by diverse weather conditions and fungal activity, wood degradation is the main reason for the reduced lifespan of wood products and their limited applicability. To avoid wood fungal deterioration, various active biocides have been applied for decades (Bjurman 1992, Bjurman 1996, Macedo 1985). However, due to health and environmental hazards some of them have recently been banned (e.g. in accordance with Directive 2004/42/EC concerning VOC or Directive 1998/8/EC about biologically active substances). Therefore, the invention of alternative environmentally friendly wood preservatives with low toxicity and the development of new technologies providing enhanced wood resistance against fungal decay have been given particular attention (Homan and Jorissen 2004). Since most defects of wood result from its hydrophilic character, organosilicon compounds comprise interesting components of wood preservatives due to their exceptional hydrophobic properties and low toxicity. According to the literature, chemical wood modification with silanes results in a decrease of wood hygroscopicity, thus reducing negative effects of exposure to water and steam and consequently provides increased wood protection against destroying fungi (Donath et al. 2004, Donath et al. 2006, Ghosh et al. 2009, Hill et al. 2004, Panov and Terziev 2009, Sebe and Brook 2001, Tingaut et al. 2006, Weigenand et al. 2008). 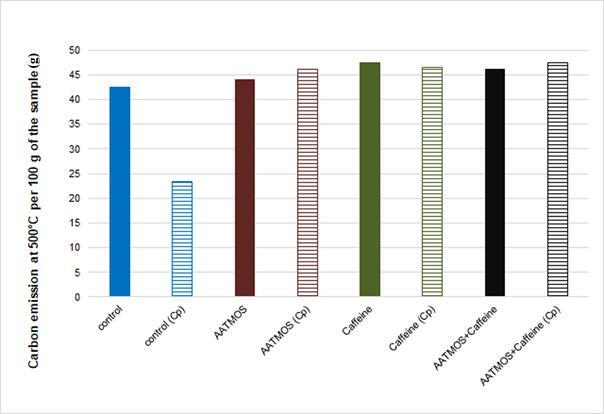 Among organosilicon compounds, aminosilanes demonstrate specific antifungal efficacy when used for the treatment of various lignocellulosic material (Donath et al. 2006, Mai and Militz 2004a, Mai and Militz 2004b, Müller et al. 2013, Rakotonirainy et al. 2008, Reinprecht and Grznárik 2015, Srimalanon et al. 2014). As natural infection-fighting substances synthesised by plants, alkaloids may become a potential alternative for biocides in wood protection, including caffeine which exhibits remarkable antibacterial and antifungal properties (Avery et al. 2005, Friedman 2007, Majhenič et al. 2007, Mohammed and Al-Bayati 2009, Raut et al. 2013). Due to its good water solubility, caffeine requires stabilisation to effectively protect wood outdoors against biodegradation. It has been proved that silane treatment can stabilise different active substances in wood (Mai and Militz 2004a, Mai and Militz 2004b, Mazela and Perdoch 2012, Panov and Terziev 2009, Panov and Terziev 2015). Therefore, a mixture of antifungal caffeine and hydrophobic silane seems to be a promising wood preservative. The aim of the research was to determine the effectiveness of wood treatment with aminosilane, caffeine and the mixture thereof to enhance its durability. Thereby, their potential impact on the environment was intended to be checked by allowing for carbon sequestration in treated wood for a longer period of time. Wood samples of 15×25×50 mm (radial × tangential × longitudinal), with nine to thirteen annual growth rings per 10 mm and the average density of 540 kg×m-3, were cut from Scots pine (Pinus sylvestris L.) sapwood in order to perform a decay resistance test as well as conduct the Total Organic Carbon (TOC) analysis. To calculate weight percentage gain (WPG), samples were oven-dried (24 h, 105ºC) to get their initial masses prior to impregnation. Ten replicates were used per treatment. Untreated pine wood samples were used as control. where W0 is the mass of an oven-dried untreated sample and Wl is the mass of an oven-dried sample after treatment and leaching. Resistance of treated and untreated wood against brown-rot fungus Coniophora puteana (Schum. : Fr.) Karst. (BAM Ebw.15) was assessed by a decay test performed in accordance with the EN 113 (BS EN 1997a). Sterilised by irradiation (2,5 Mrad.) prior to the decay test, wood samples were aseptically placed on sterile 3 mm specimen glass supports on the cultures of the test fungus actively growing on 5% malt agar in Kolle flasks. An additional set of sterile control samples was used to assess operational control losses. The closed flasks were incubated for 16 weeks at 22 ± 1ºC and 70 ± 5% relative humidity. Subsequent to cultivation, the specimens were removed from Kolle flasks, brushed free of mycelium, oven-dried at 105ºC for 24 h and weighed. Weight loss (%) was expressed as a percentage of the initial oven-dried weight of the sample. Weight losses from sterile controls were subtracted from the decay results to give corrected data calculated from the dry mass before and after the test. The total carbon content and the emission of carbon were determined using the Total Organic Carbon analyser (TOC-L) (Shimadzu, Japan) with a solid sample module SSM-5000A (Shimadzu, Japan). The analysis was divided into two independent steps: (1) combustion in the furnace (SSM 5000) and then (2) the total carbon (or carbon extracted in 60°C) transport through the cell into the TC analyser detector (IR) for final determination. determination of carbon released at 60°C (temperature to simulate the real weather conditions). Five replicates of each type of wood sample were analysed in each measurement variant. The glucose ASC reagent (Sigma-Aldrich, USA) was used for calibration. In the case of the determination of carbon emission at 60°C the time of signal collection was extended to 15 min/sample. 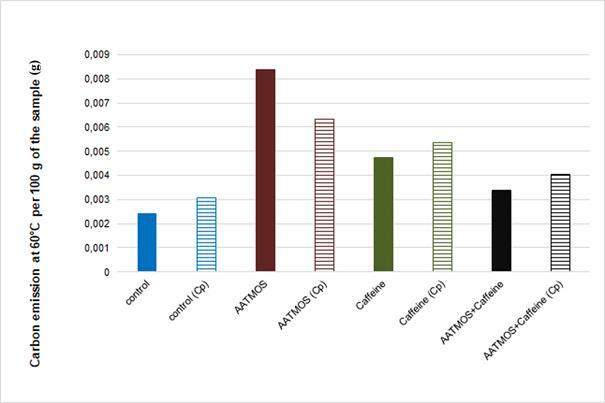 Various resistance of wood against the tested fungus was observed depending on the preserving formulation used (impregnation mixture of caffeine and AATMOS or its individual components) and application of accelerated leaching procedure (Table 1). Pine wood treated with an aqueous solution of 5% AATMOS showed antifungal resistance at a weight loss (WL) level of 1,3% and 21% for unleached and leached samples, respectively. 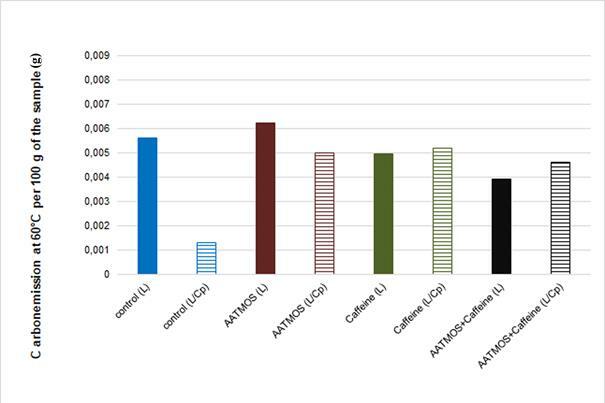 The difference between WL values clearly indicates high leachability of AATMOS from wood, which suggests low reactivity of this substance with wood components. Similarly, wood treated with an aqueous solution of 2% caffeine also showed higher antifungal resistance without ageing procedure (WL before leaching was 1,4% and after leaching - 20,7%). This confirms low caffeine reactivity with wood resulting in its high leachability. In turn, wood treated with the impregnation mixture of the components showed high antifungal resistance both before and after accelerated leaching. WL after exposure to C. puteana was 1,7% and 2,4%, respectively. The results obtained suggest the synergistic action of caffeine and AATMOS resulting in the mixture resistance to leaching and effective combating biological degradation of treated wood. As it was proven before, alkoxysilanes can form stable chemical bonds (Si-C and Si-O) with wood components and interact with various active substances, thus preventing their leaching from wood (Mai and Militz 2004a, Mai and Militz 2004b, Mazela and Perdoch 2012, Panov and Terziev 2009, Panov and Terziev 2015). The same type of interactions was also shown for the mixture of silanes, propolis and caffeine (Ratajczak et al. 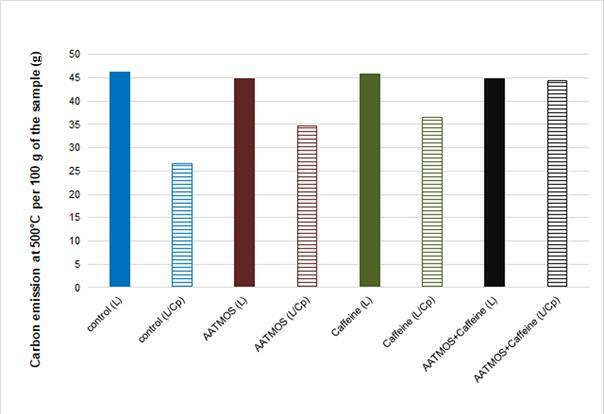 2017), suggesting the possible mechanism of caffeine stabilisation in wood by AATMOS. 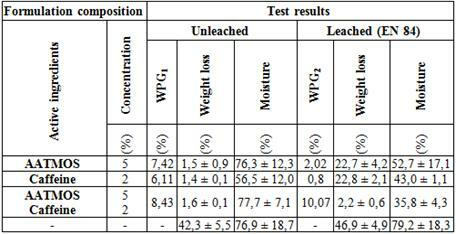 Table 1: The results of the mycological test against C. puteana. 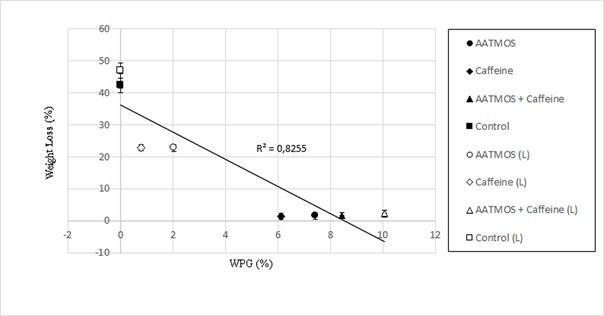 The relationship between WPG due to treatment (and leaching) against percentage weight loss (WL) of wood following exposure to C. puteana is shown in Figure 1. Data points represent the average of five repetitions of each variant examined. The fit shown by linear regression analysis indicates a positive relationship between the effectiveness of the treatment with AATMOS, caffeine and the mixture thereof and decay resistance. The data show that WPG of approximately 8,5% is required following treatment (and leaching) to ensure antifungal protection, irrespective of the composition of the impregnation mixture used. Figure 1: Data from the decay test against C. puteana corrected for weight loss from sterile controls (L - the results for leached samples). The results of Total Carbon analysis are presented in Figure 2 and Figure 3. Total carbon content (CC) in non-impregnated wood was about 45 g per 100 g of the initial mass of the wood sample (IMWS) for samples not subjected to accelerated leaching procedure and 46,4 g for samples subjected to leaching. Wood degradation following exposure to C. puteana resulted in a decrease in CC to about 24 g and 30 g per 100 g of IMWS, respectively. It reflects the mass loss of wood degraded by fungi and can be explained by the use of carbon deposited in wood for their life processes. As it was shown by Hietala et al. (2015), an up-scaling of CO2 efflux, that resulted from microbial respiration and mineralisation of wood, was observed due to wood decay in living trees. Therefore, the total carbon content in biodegraded wood must decrease the following decay. The results of both the mycological tests and the Total Carbon analyses are consistent and indicate higher vulnerability of leached untreated wood to biodegradation resulting in a higher rate of carbon release from wood into the environment during degradation. The treated wood was characterised by only a slightly increased CC in comparison with the untreated wood, ranging from 45,8 g to 47,9 g per 100 g of IMWS. Such a small difference in carbon content between untreated and treated wood results from similar carbon content in wood chemical components and the treatment chemicals used. Comparing carbon content in the unleached treated wood samples before and after exposure to C. puteana, no major differences were observed. This can be explained by the high resistance of the treated wood to biodegradation. Lack of mass losses following exposure to wood destroying fungus resulted in similar CC in comparison to the state before the mycological test. By contrast, quite a large difference was observed between leached wood samples before and after exposure to C. puteana. Leaching of AATMOS and caffeine from wood resulted in its increased susceptibility to fungal degradation, which caused weight loss of the wood samples of about 22%. As a consequence, the lower carbon content was observed in the respective wood samples (36,8 g and 39,1 g per 100 g of IMWS) in comparison with their counterparts not subjected to fungus activity (CC of 46,3 g and 45,8 g per 100 g of IMWS, respectively). As demonstrated by Diyarova (2016), large amounts of carbon dioxide are emitted during fungal degradation. For instance, in the case of wood samples with a moisture content of about 50% exposed to fungal decay at the optimal temperature for fungal growth of about 22ºC, the CO2 emission of around 0,8-1 mg per dm2×h-1 was registered, resulting from decomposition of wood structural components and microbial respiration. Taking into consideration the time of mycological test described herein, this explains a decreased carbon content in decayed wood samples. In turn, no difference in carbon content was observed in the case of leached wood samples treated with the impregnation mixture of AATMOS and caffeine before and after exposure to fungus (47,4 g and 47 g per 100 g of IMWS), similarly to unleached samples. This could be explained by the high resistance of treated wood samples to fungal degradation resulting from the effectiveness of the mixture used, regardless of whether the accelerated leaching was applied. 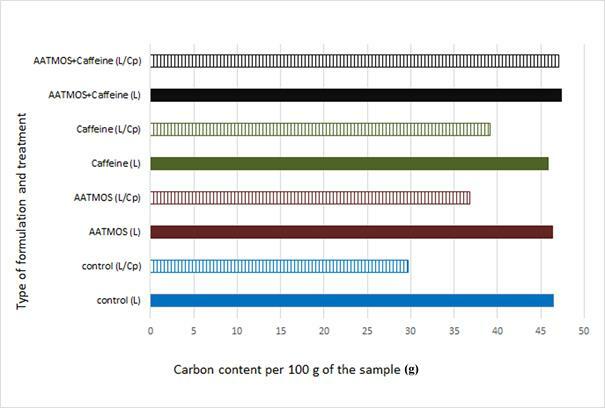 Figure 2: Total carbon content in treated and untreated wood samples per 100 g of initial mass of the wood sample (without leaching); Cp - results for wood after exposure to C. puteana. Figure 3: Total carbon content in treated and untreated wood samples per 100 g of the initial mass of the wood sample (after accelerated leaching - L); Cp - results for wood after exposure to C. puteana. The results of carbon emission measurements at 60°C and 500°C from wood samples impregnated with different formulations are presented in Figure 4, Figure 5, Figure 6 and Figure 7. The measurement temperatures applied result from a practical point of view in the context of the conditions of external use of wood products (60°C) and the potential disposal of post-consumer wood (500°C). It should be stressed that carbon emission measurement at 60°C lasted only 15 minutes (limitation due to the method of analysis used). Therefore, the amount of carbon released from wood samples in this period of time was very small, in the order of several milligrams. However, even such a result allows, to a certain degree, for assessment whether and to what extent the type of preserving formulation applied influenced carbon emission from the treated wood products to the atmosphere. Figure 4: Carbon emission at 60°C per 100 g of the initial mass of the wood sample (without leaching); Cp - results for wood after exposure to C. puteana. Figure 5: Carbon emission at 60°C per 100 g of the initial mass of the wood sample (after accelerated leaching - L); Cp - results for wood after exposure to C. puteana, L - leaching procedure applied. The lowest carbon emission at the temperature of 60°C (only 0,0013 g per 100 g of IMWS) was observed from the untreated leached wood degraded by fungi. Slightly more carbon was released from the untreated unleached wood both before and after exposure to C. puteana (0,0024 g and 0,003 g per 100 g of IMWS). In contrast, the leached wood not exposed to fungus emitted 0,0056 g of carbon per 100 g of IMWS during measurement. This results from the fact that accelerated leaching disturbed the interactions between wood chemical components increasing wood durability and making it more vulnerable to further degradation under the influence of temperature. Low carbon emission from the untreated samples degraded by fungi can be explained by the fact that all wood components highly susceptible to degradation have already been decomposed by fungi. Therefore, only strongly chemically linked carbon remained in wood, not vulnerable to releasing to the atmosphere under the influence of the temperature that reflects natural external conditions during the warm season. In general, higher carbon emission at the temperature of 60°C was observed from the samples degraded by fungi in comparison with those not exposed to the fungus. It was due to the fact that fungal degradation weakened chemical interactions within wood components, making them more susceptible to further decomposition (and carbon release) due to increased temperature. In the case of AATMOS-treated wood and untreated leached wood, the situation was the opposite. From among treated wood, the highest carbon emission at 60°C was observed from samples treated with 5% AATMOS, both leached and unleached (0,0062 g and 0,0083 g per 100 g of IMWS). 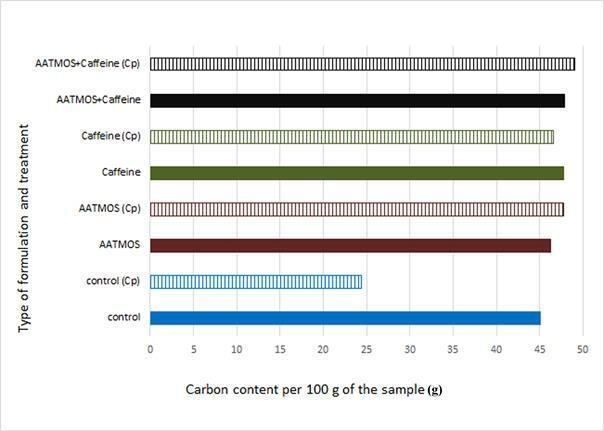 In turn, the lowest carbon emission values, ranging from 0,0033 g to 0,0046 g per 100 g of IMWS, were obtained for all wood samples treated with the mixture of AATMOS and caffeine (leached and unleached, before and after exposure to fungus). This could result from the interactions between the mixture components with themselves and with wood, making the wood more durable (with carbon strongly linked within wood components). Figure 6: Carbon emission at 500°C per 100 g of the initial mass of the wood sample (without leaching); Cp - results for wood after exposure to C. puteana. Figure 7: Carbon emission at 500°C per 100 g of the initial mass of the wood sample (after accelerated leaching - L); Cp - results for wood after exposure to C. puteana, L - leaching procedure applied. While the carbon emission from wood products during their lifespan is important from the ecological point of view, also the carbon release during disposal of post-consumer wood is no less significant. Although a re-use is a priority for wood products after one service unit, eventually they will be disposed of in an appropriate way. The more durable the wood product is, which is reflected in its longer lifespan, the longer is the period of carbon sequestration in wood. And the more carbon is sequestered in a wood product, the more of it will be released during its utilisation (with simultaneous energy production, e.g. by incineration). All the wood samples (untreated and treated) that were not exposed to fungal degradation showed high carbon emission (about 45 g per 100 g of IMWS) at the temperature of 500°C. Among the decayed wood samples, the lowest carbon emission (ranging from 23,3 to 36,5 g per 100 g of IMWS) was observed from those which were most susceptible to fungal degradation, that is leached and unleached untreated wood and leached wood treated with individual compounds: 5% AATMOS and 2% caffeine. It resulted from the lowest carbon content in these wood samples as a consequence of mass loss of wood (and the loss of carbon) due to fungal degradation. On the contrary, due to their high resistance to fungal degradation, the highest carbon emission was registered from the unleached treated samples (about 46 g per 100 g of IMWS). Special attention should be given to wood samples treated with the mixture of AATMOS and caffeine after exposure to fungi. They showed the highest carbon emission at 500°C, regardless of whether they were subjected to accelerated leaching prior to the mycological test or not (44,4 and 47,5 g per 100 g of IMWS, respectively). This confirms the observations from the previous analysis described above and points to possible interactions between the two chemicals and wood components, resulting in higher carbon “fixation” in wood treated with this impregnation mixture. Wood and wood products, as integral parts of the global carbon cycle, influence climate changes. Due to appropriate wood protection, an extension of life for wood products will facilitate a longer period of carbon capture in wood and a reduction of CO2 emission. Therefore, finding new formulations increasing wood durability can contribute to the protection of a sustainable environment and help to limit global warming and climate change. The best protection against fungal degradation and the highest carbon sequestration effectiveness were achieved for wood treated with the mixture of 5% AATMOS and 2% caffeine in aqueous solution. From the results of the fungal tests and the total carbon analyses, it appears that the two compounds (the alkaloid and the silane) are very likely to interact with each other as well as with wood components. This prevents their leachability from wood, which was observed in the case of one-component treatment, and ensures wood resistance against decaying fungi. What is more, this enables better “fixation” of carbon in the treated product (as confirmed by high total carbon content and high carbon emission at 500°C from wood treated with the mixture), preventing its emission from wood to the atmosphere while exposed outside (as reflected in the results of the carbon emission measurement at the temperature of 60°C). Increased durability of the treated wood product extends its lifespan. This way it provides carbon storage in wood for a longer period of time and renders the treated wood product more attractive to industry as a construction material. There is no current data given in reference literature for the area specified in the presented article. Therefore, the research is an attempt to bridge the gap between environmental studies concerning the carbon cycle within forest ecosystems and forest industry, and application research oriented on searching new practical solutions for the wood industry. Only a multi-directional approach to the global warming problem would ensure an effective outcome. The research was supported by Norway Grants and the National Centre for Research and Development of Poland (NCRD) as a part of Polish-Norwegian Research Program in the frame of the project "Superior bio-friendly systems for enhanced wood durability” (No. Pol-Nor/203119/32, DURAWOOD) .